We've come to expect a certain degree of insanity from the Texas State Fair, but most of it is of the fried Thanksgiving dinner variety. This year, even the libations are going crazy, as the fair peeps just revealed a Funnel Cake Ale that'll be on tap for the Fall festivities. 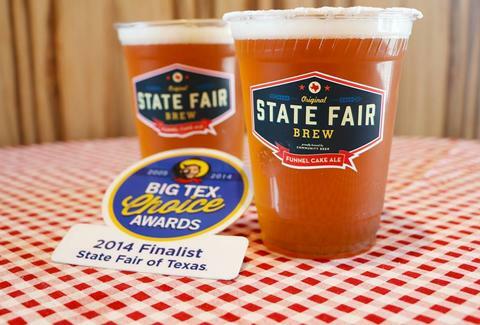 Though the fair is still a month away from kick-off, we got a preview of some of the wilder concessions today when the higher powers released their 2014 Big Tex Choice Award finalists. This Funnel Cake Ale by Justin Martinez was obviously one of them. Brewed with Community Beer Company, the English-style Summer ale is meant to taste just like funnel cake, and you can even request powdered sugar along the rim for the full effect. If funnel cake beer isn't your scene (Commie), you can also look forward to headliners like a science-defying Fried Gulf Shrimp Boil, Fried Sriracha Balls, and Fried Sweet Texas, a remarkable blend of pecan pie, peach cobbler, and buttermilk pie. Should all your exes, in fact, live in Texas, give the least crazy one a call so you can visit these masterpieces come September 26. Kristin Hunt is a food/drink staff writer for Thrillist and needs a slice of the Fried Sweet Texas in her life pronto. Follow her at @kristin_hunt.